Steven Sano has seen destruction. As a volunteer for the American Red Cross, he was there shortly after an EF5 tornado ripped Joplin, Mo., apart. He was there after Hurricane Irene struck New York. Sano volunteered his expertise as a community development consultant in these devastated areas to help pull the cities back together and get people access to the aid they needed. In Joplin, Sano coordinated operations at the Multi-Agency Resource Center, which brought together all sectors of the community, from government agencies such as Federal Emergency Management Agency, the U.S. Small Business Administration and various Missouri state and local governments to the Salvation Army, Habitat for Humanity and Missouri Legal Aid. When a disaster happens, the Red Cross responds to immediate needs. For long-term recovery, however, community partnerships are necessary “to help everyone get back on their feet,” Sano said. In Joplin, there are pockets of Mexican, Vietnamese and Chinese communities. So Sano focused on identifying specialized resources to aid these residents. As the son of Japanese American parents who were held in internment camps in the U.S. during World War II, Sano is particularly sensitive to issues of social justice. “Part of my obligation and responsibility is to share my experience to help make things better as a community, as a whole,” he said. 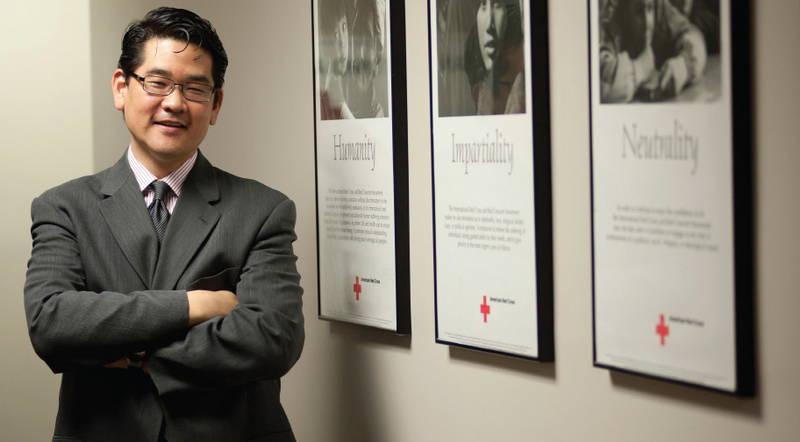 Sano volunteered his expertise with the Red Cross again this summer after Hurricane Irene caused severe flooding in New York. After listening at community meetings to the priorities of those affected, he was able to manage partnerships and ease tensions between those who needed help and those trying to provide it. Without the support of the people who live in the area, he said, the changes will not be lasting. Sano’s work stretches across the border as well. He is working on a proposal to link the American Red Cross with the Cruz Roja Mexicana, the Mexican National Red Cross, to offer mutual aid between the countries in times of disaster. A New York chapter of the Red Cross has also asked him to assist in creating a similar initiative between the American and Canadian Red Cross organizations. Because of his volunteer efforts, Sano has been able to bring back ideas and best practices to the San Antonio area, where he runs Merxcis, LLC, a consulting firm that assists with community and neighborhood planning and development. A strand of beads helps one soldier form strong connections around the world. A doctoral student takes her love of nature into the classroom and the lab. Gala raises a record $150,000 for scholarships. A compilation of alumni submissions and reports from newspapers and other media outlets. Want to learn math? There’s an app for that.